UNTIL THE LATE 1950S, THERE WERE ONLY A FEW COMMUNITY-WIDE JEWISH ORGANIZATIONS AND JUST TWO SYNAGOGUES IN THE SARASOTA-MANATEE AREA. THE SINGLE MOST IMPORTANT EVENT-- WHICH ENCOMPASSED THE ENTIRE JEWISH COMMUNITY AT THAT TIME-- WAS THE UNITED JEWISH APPEAL (UJA) ANNUAL CAMPAIGN. Formed in January of 1939, UJA quickly became the primary American fundraising organization committed to Jewish causes outside the United States. From its outset, the UJA collaborated with regional federations to provide relief to Jewish groups in Europe, sending abroad a portion of the revenue raised by the federations. Between January and December 1939, UJA raised $14 million to help German Jews escape the Nazis. After World War II – as American Jews confronted the tragedy of the Holocaust – UJA took a central role in bringing Jewish refugees out of Europe and resettling them in the United States. In 1946, the organization collected $100 million during one campaign alone, and in 1947, it oversaw the arrival of more than 25,000 Jewish survivors to the United States. In 1948, UJA’s focus changed dramatically with the founding of the State of Israel. Instead of bringing Jewish war and Holocaust survivors to the United States, UJA raised $200 million in 1948 to resettle them in Israel. In the late 1950s, Jews in Sarasota-Manatee – who were just beginning to have a noticeable presence in the general community – became concerned with the needs of their brothers and sisters around the world, particularly in Israel. They decided it was time to have a central organization to coordinate the activities of the community. On February 25, 1959, the Articles of Incorporation were signed, and the charter granted for the Sarasota Jewish Community Council. In 1980, the name of the organization was changed to the Sarasota Jewish Federation. In 1982, the name was amended to the Sarasota-Manatee Jewish Federation to give full recognition to the constituents who lived in the northern county and whose numbers and influence were growing. And in 2009, the name was amended to The Jewish Federation of Sarasota-Manatee. 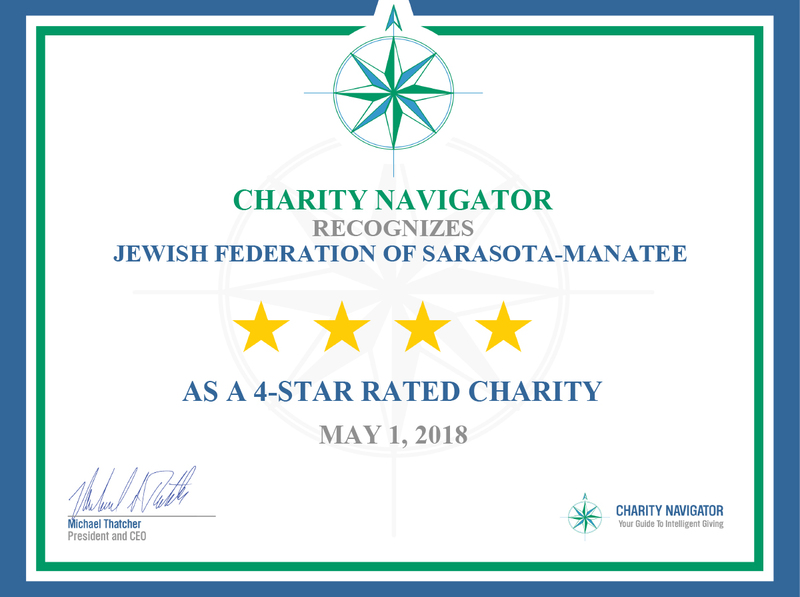 Over the years, Federation leadership and Jewish community donors helped to found three “partner” Jewish agencies: Jewish Family and Children’s Service (1984), the Sarasota-Manatee Jewish Housing Council (1988) and the Flanzer Jewish Community Center (1989-2007). For many years, the Federation’s function was to raise funds and distribute them through unrestricted allocations locally (through the three partner agencies) and overseas (through its parent organization, The Jewish Federations of North America; formerly known as United Jewish Appeal/Communities). The allocations were split fairly between local and overseas needs. In the past decade, the Federation has moved toward a granting model. The Federation now has no unrestricted allocations – all monies are given through the granting process, ensuring that programs support and advance the Federation’s mission and priorities. In addition, all granted programs, including Federation-implemented programs, are now subject to an evaluation process to verify that programs meet stated goals. UJA Poster, “Build Refuge and Jewish National Home.” Artist: David Ismar. Circa 1945. Breaking ground on the Klingenstein Jewish Center on McIntosh Rd. in Sarasota. Circa 1980. Flanzer Jewish Community Center. Circa 1989. Want to Learn More About Jewish History in the Sarasota-Manatee Area? to read "Beth Sholom Synagogue: The Building of the Sarasota Jewish Community​"